Despite the recent dressing down of Cebu City Mayor Tomas Osmeña by President Rodrigo Roa Duterte, the Duterte and Osmeña families have always been allies and connected. Mayor Tom's grandfather, President Sergio Osmeña Sr., appointed Vicente Gonzales Duterte, the father of President Duterte, as acting Mayor of Danao, Cebu on January 4, 1946. Meanwhile, Sergio "Serging" Chiong Veloso Osmeña Jr., son of President Osmeña, who first became Cebu City mayor from 1956 to 1957, was followed by Ramon Gonzales Duterte, brother of Vicente Duterte, who served from 1957 to 1959. Later, the first cousin of President Duterte, Ronald Regis Duterte, served as Cebu mayor from 1983 to 1986. He was then followed as mayor by John Henry Osmeña, another grandson of President Osmeña, who served from 1986 to 1987. Mayor Tomas Osmeña and President Duterte also served as city mayors of their respective cities from1988 to 1995, then from 2001 to 2010. But the most interesting tidbit is this: President Duterte's fourth cousin, Melanie Borromeo, married Mayor Osmeña's second cousin, Raul del Mar. 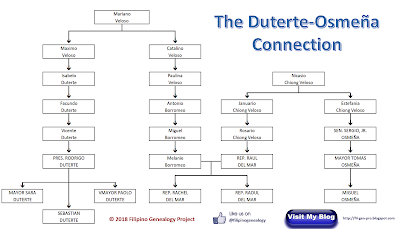 Which means that not only are Duterte and Osmeña cousins-in-law, their children are blood cousins of the children of Raul del Mar and Melanie Borromeo. 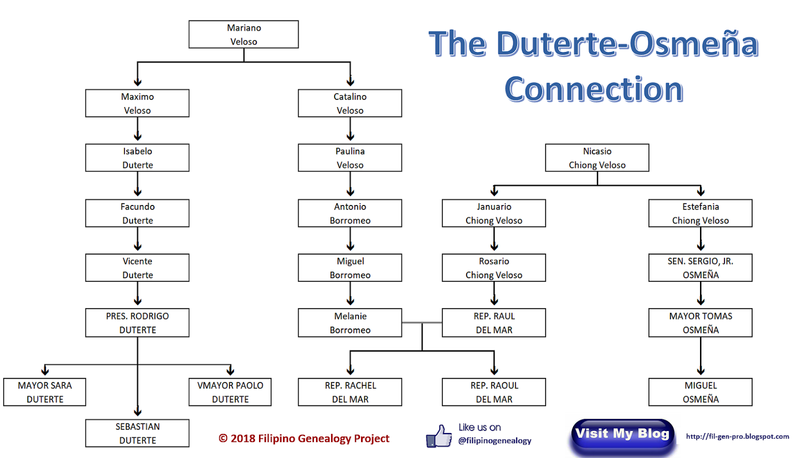 Philippine politics truly is a tangled web of family affairs.